Good and roomy, but soft filter bag that could have been better with an inlay to stiffen it. More than big enough for my 77mm filters, with room to spare. 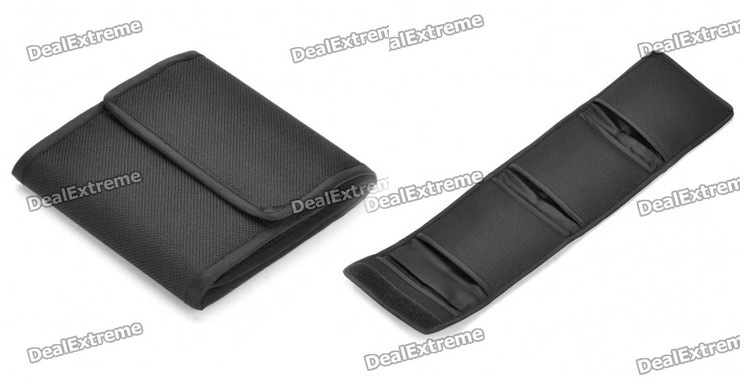 It has an OK price, it is easy to use and it is made of good material and has a good Velcro lock. It could have benefited from a hard separator to keep it from bending, but this is not a big deal. No place for labeling the filters, but do you really need that? It could have had some sort of strap to keep each filter inside their pocket. The material feels good and the Velcro appears to be of good quality. If you don't need 3 pockets, maybe use one for a plate of plastic or cardboard to stiffen it.